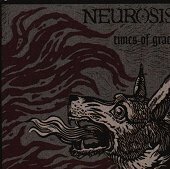 Neurosis is back with another brutal slab or metal sure to make your bones shake, teeth ache, and body go numb with its crushing force. They get a heart-pounding groove going before ripping right into the metal, then they slide back into a groove to help you unwind, before winding you back up again. This seems to be their plan of attack throughout the album, as they never give up and just keep recycling it over and over again. Now, when they're in full-force and beating down the door to your mind, they seem to be in top shape, but a lot of the album is spend building up the song with a windy presence, before attacking at the knees and drawing back again. They seem to loose all momentum and just don't have what it takes to really secure their metal vibe. Another thing, the songs are either too long (five to seven minutes), or they're around two minutes and the band still wastes time slowly building up the song and then having it never amount to much. The album is best described as a psychedelic, acid-tripping metal album that likes to shy away from its metal side. I'll give it a D.